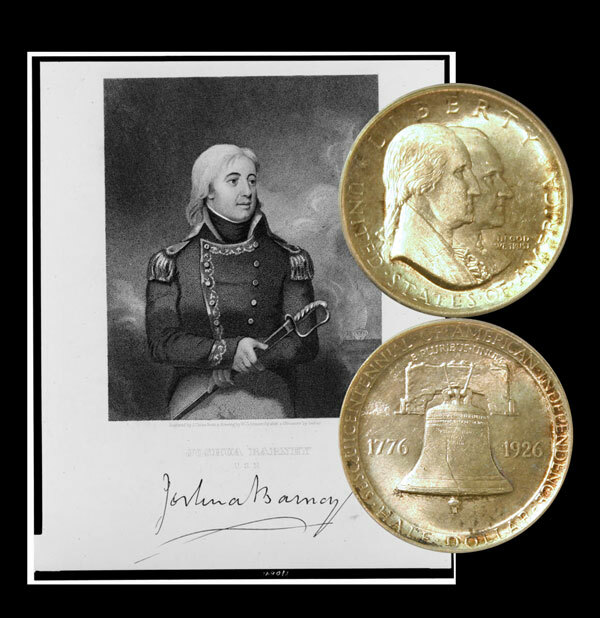 Today, the Sesquicentennial of American Independence Commemorative Silver Half Dollar Coin remembers a short —30 minutes— battle 234 years ago in the Delaware Bay. Once again, an American military leader used a minor deception to surprise the enemy and win the battle with fewer men and guns. In April, 1782, an action took place between the Pennsylvania State cruiser Hyder Ally and the British cruiser General Monk, which in many respects was one of the most brilliant affairs of the war. The former was a merchant ship carrying sixteen 6-pounders and a crew of one hundred and ten men, under Lieutenant Joshua Barney. The Hyder Ally had orders to convoy a fleet of merchantmen down to the capes and then return to the State jurisdiction, as it was not intended to protect vessels beyond those boundaries. On the 8th of April the convoy dropped down to Cape May Roads, and while the merchantmen were waiting for a breeze to take them to sea two English cruisers were descried standing for them. Lieutenant Barney immediately signaled the merchantmen to make sail up the bay while he covered their retreat. The first Englishman soon came up with the Hyder Ally, but after discharging a broadside he passed up the bay after the merchantmen. Lieutenant Barney made no reply to this fire, but reserved himself for the second vessel, which was the 20-gun sloop of war General Monk. On came the Englishman, and he was about to pass the Hyder Ally as his consort had done, when the Americans fired a broadside at pistol shot, upon which the General Monk put about so as to board. The helmsmen understood their cue, and clapping the wheel hard to the starboard brought the Englishman’s jib boom afoul of their fore rigging, which exposed him to a raking fire from the entire American broadside. Immediately lashing the spar to his fore rigging, Lieutenant Barney poured several broadsides in rapid succession upon the helpless Englishmen, so that in thirty minutes they were obliged to surrender. Hastily securing his prize, Lieutenant Barney made sail up the bay and rejoined his convoy before another English ship, a frigate, could come within range. The General Monk, Captain Rodgers, mounted twenty 9-pounders and carried a crew of one hundred and thirty-six men, of whom twenty were killed and thirty-three were wounded. The Hyder Ally mounted sixteen 6-pounders and carried a crew of one hundred and ten men. Her loss was four killed and eleven wounded. It is, of course, to be regretted that the General Monk’s guns “overset” and became ” heated ” in the presence of an enemy, but it is remarkable that Mr. Gilpin had not discovered these qualities in the General Monk’s guns before this action, for he had described her as a most useful and successful ship. The General Monk was taken into the United States service under the name of General Washington. The winner of this battle, Joshua Barney, continued in the naval service after the Revolutionary War and rose to the rank of Commodore during the War of 1812. Commodore Barney died on December 10, 1818 in Pittsburgh, Pennsylvania while en route to Kentucky., His death, at age 59, resulted from complications of a wound he received at the Battle of Bladensburg. The Sesquicentennial of American Independence Commemorative Silver Half Dollar Coin shows with a portrait image of Joshua Barney.